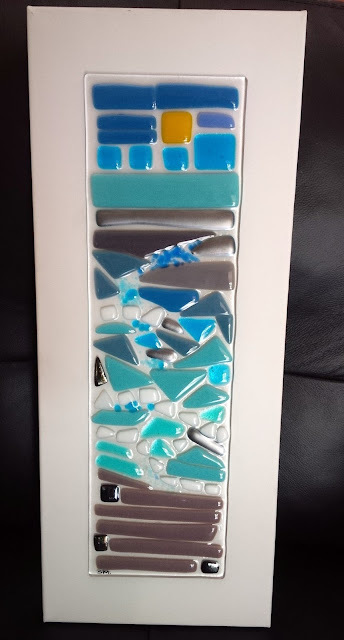 You might remember a couple of weeks ago I told you about a fused glass workshop I'd been on, and showed you some work in progress pictures of the piece I made. Well, last week I was finally able to collect the panel after it had been fired and mounted, so I thought you might like to see what it looks like now it is complete. And here's the finished panel, mounted and ready to hang. Not sure where it's going to go yet. As you can see, firing didn't change it by much. Some of the pieces just below the sky that are very dark blue before firing became silver, and with the other pieces the edges just softened a little. You would get more dramatic changes I think if you had several layers of glass on top of each other, but mine was all single layer on the base. I loved doing this and have already booked on another workshop in September. I thought I'd also show you another free motion embroidery I'm working on. I did this in a couple of hours at Fabric HQ's Sewcial last week, stitching through a traced drawing on tissue paper which I then peeled off afterwards. The white pieces are remains of the tissue. I might leave them, I quite like the effect. that free motion! be still my heart!!! Aw, thank you! Actually, she reminds me of you! I love these fashion embroidery pieces you've been doing lately! Your fused piece also looks great! Thanks Gail, I do too! Thinking of doing some based on vintage sewing pattern illustrations. Awesome! Can you hang the glass piece in front of a window? I did some stained glass pieces in college and my mom has them hanging from chain in front of a window. You know I love your embroidery pieces, too. It's actually mounted on the canvas, so I can't hang it in front of a window. I think it will go in the bathroom - it seems like the right colours for a bathroom. Absolutely loving these new embroidery pieces. I love the idea of using vintage sewing patterns! Thanks Claire. I think I'm going to dig out a few of my vintage patterns and have a go with one of them.